Over 102 million bales of cotton (more than 24 million tons of cotton) were grown around the world last year. I wouldn’t surprise me to hear cotton called the single most important (and widely cultivated) food crop on the face of the planet. But does it have to be a non-food crop? Cotton produces a chemical called Gossypol which is very effective at controlling insects, but also has a lot of nasty effects on humans and other animals. The AP article I’m going to link to in a little while mentions that chickens die within a week when feed straight cotton seeds. Simply eating oil pressed from the cotton seeds but not properly purified can make men sterile (over prolonged periods of time). Right now some cotton seed is feed to cows, which can break down small amounts of gossypol and much of the rest is pressed for oil that goes through a complex set of treatments to remove gossypol, making it safe for human consumption. Now scientists and farmers have known about the negative effects of gossypol for a long time, and I’m not the first or even the millionth to suggest how wonderful it would be if humans (or even pigs and chickens) could eat some of the tons of protein produced by cotton plants every year. As far back as the 1950s scientists had discovered naturally occurring mutations of cotton that did not produce gossypol***, but since the chemical plays an important role in protecting against insect pests, the mutant cotton plants were attacked a lot more by insects. Enter modern genetic engineering in the person of Keerti S. Rathore a professor at Texas A&M. Dr. Rathore addressed the problem of maintaining the cotton plant’s natural defenses while making cotton seeds edible by using genetic engineering**** to create a plant that continued to express gossypol everywhere EXCEPT in the seeds. The result is plants that are still protected against insect pests, but produce seeds edible to humans and more animals, a major consideration considering over half of all cotton is produced by India and China, two countries that are likely to face difficulty feeding their growing populations in coming decades. Cotton carrying his newly developed trait would also be of great benefit to cotton farmers in the US (the #3 cotton producer in the world) as it would turn cottonseeds that are currently sold as cattle feed and for oil production, into an increased source of value. Of course while a plant that makes NO gossypol would be completely unregulated (and rightly so), Professor Rathore’s cotton which does the EXACT same thing, only in a much smaller part of the plant will spend at least the next decade jumping through regulatory hoops before it can be sold in the US and that assuming a major agricultural company thinks increase the profits of American cotton farmers and increasing the supply of protein available to poor cotton farmers around the world would be profitable enough to justify the $100 million dollar price tag satisfying all those regulations requires. If you’re opposed to genetic engineering, I want to hear from you. Does this make sense to you? To me it seems ridiculous that it’s effectively free to commercialize naturally occurring mutations with drastic effects on plants (and has been throughout recorded history), but small, controlled changes like those produced Professor Rathore and his lab are so heavily regulated many beneficial traits will never see the light of day. But I don’t have a problem with the technology is the first place, so have no idea what your perspective would be. My previous post on cotton and it’s current genetically engineered traits. Edit: In the comments Karl points out his own much more detailed coverage of the science behind this trait over at Biofortified. 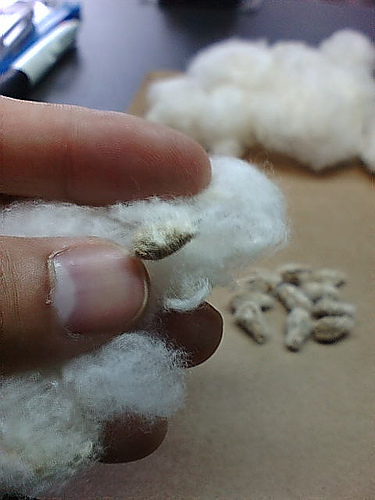 *Historically, separating the seeds (usually considered waste) from the cotton fibers required lots of human labor, but was eventually mechanized by a device called the Cotton Gin around the end of the 18th century, which had all sorts of economic, social, and political effects on the United States in the pre-Civil war area, which was producing huge amounts of cotton. **In fact they already show up in our food supply to a limited extent as cottonseed oil. ****Specifically he used a technique where a copy of an gene already found in a plant is inserted backwards into the genome. The reversed copy binds to the copy produced by the plant already, which triggers a natural plant response (Called RNAi sort for RNA-interference) which results in the silencing of both copies. This response is used by plants to regulate their own genes, protect against excessive expression of transposons (jumping genes) and defend again viruses. This was the same technique used in the development of the Flavr Savr tomato, a scientific success if economic failure. *****The professor has the misfortune to share a last name as well as first and middle initial with someone publishing in medical journals. There are a LOT of medical papers out there, which is why top level journals like Science and Nature will often have lower impact factors (effectively the average number of times a paper published in that journal is cited by other papers) than specialized immunology and cancer journals. So many medical papers are written every year that an interesting medical paper will be cited a LOT more than an interesting paper in another scientific field. Posted in: agriculture, Feeding the world, Plants. This is a pretty awesome achievement. When I first heard about the start of its development, I realized that I needed to start telling people about this stuff rather than blathering on about creationists on my blog. Thanks for the link Karl. I’ve added it to the list of recommended further reading. I should have known about it myself, but looks like you wrote it up just as I was getting re-engaged with discussion of genetic engineering online. Plus it kind of got buried as soon as the Changemakers contest deadline hit. This fall has gone by way too quickly – it felt like I wrote that just a few weeks ago.